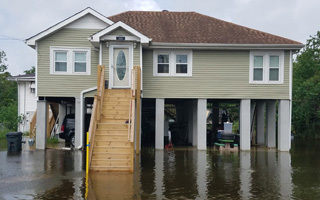 Since 2006, Lowe's Construction, LLC has built a solid reputation as a local New Orleans home elevation specialist proudly serving Louisiana, Texas, Mississippi, Alabama and Florida with a high level of competence and integrity. When it comes to home elevations in these areas, you can't accept anything less than the best. Lowe's Construction, LLC puts a premium on providing consistent quality and true customer service. We offer a wide range of professional residential construction services including home elevations, shoring, new construction, remodeling and more. We proudly serve Louisiana and Texas. To all homeowners from New Orleans to Houston, we offer all of the comprehensive experience you would expect from experienced home elevation contractors; skilled workmanship; conscientious supervision; financial responsibility; and our comprehensive, accurate job quotes. Our company aims for complete customer satisfaction on every job. We stand behind our projects and our personnel every step of the way. We invite you to make your own appraisal of our qualifications, skill and dedication. 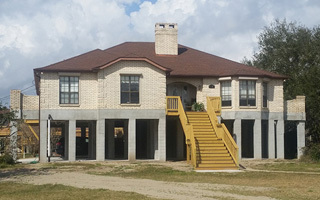 Superior quality is the standard for our Louisiana and Texas home elevation services, and it is at the starting point and finish line of every project we undertake. Make a solid investment in the future of your home by putting the craftsmanship and dedication of Lowe's Construction, LLC to work for you. Please take a look at our photo gallery or feel free to read the testimonials from several of our most satisfied clients. For a complete list of what we offer, please visit our services page. Reliable – Our company offers only high quality home elevation services for our Louisiana and Houston area clients. We take the care and attention to do your job right the first time. Flexible – Fully compliant with your protocol and procedures and with your needed construction services. Sensitive to your situation – We respect that you'll be spending time away from your home while it is under construction. Your time extremely important to us, so we will seek to get your project completed on time or ahead of schedule so you can get back to your life. Locally Owned - and proud of it! Our specialists live here and take pride in the work they do for our local clients. As a local family owned and operated, New Orleans based business, every one of our customers is extremely valued. It is our goal to earn your trust and keep your business for years to come.. Please click the orange button below and provide us with your contact information and tell us more about your home elevation needs. We look forward to working with you!